Italian astronaut Luca Parmitano shares a lot of fantastic photos taken from his privileged position 260 miles up aboard the Space Station, orbiting the planet 16 times a day. This is his latest, a stunning view of nighttime city lights spread out beneath a glowing dome of ghostly airglow and shimmering aurorae, with a backdrop of brightly shining stars. The dark silhouette of a solar array is in the foreground at right. Luca Parmitano is the first of ESA’s new generation of astronauts to fly into space. The current mission, Volare, is ESA’s fifth long-duration Space Station mission. During his six-month-long stay aboard the ISS, Luca has been conducting research for ESA and international partners as well as taken many photographs of our planet, sharing them on Twitter, Flickr, and the Volare mission blog. See this and more photos taken by Luca on the Volare Flickr page here. Look closely at this beautiful serene view taken by Miguel Claro from Portugal. Not only is it a stunning view of the skies over Lake Alqueva in the Dark Sky Alqueva Reserve in Portugal, but there are also several scientifically interesting features here. Of course, visible is the arc of the Milky Way, filled with colors and light. Seen here is the most central region of the Milky Way, located near the constellations of Scorpio and Sagittarius, where you might recognize many deep sky objects like the Lagoon Nebula (M8) and the Trifid Nebula (M20). 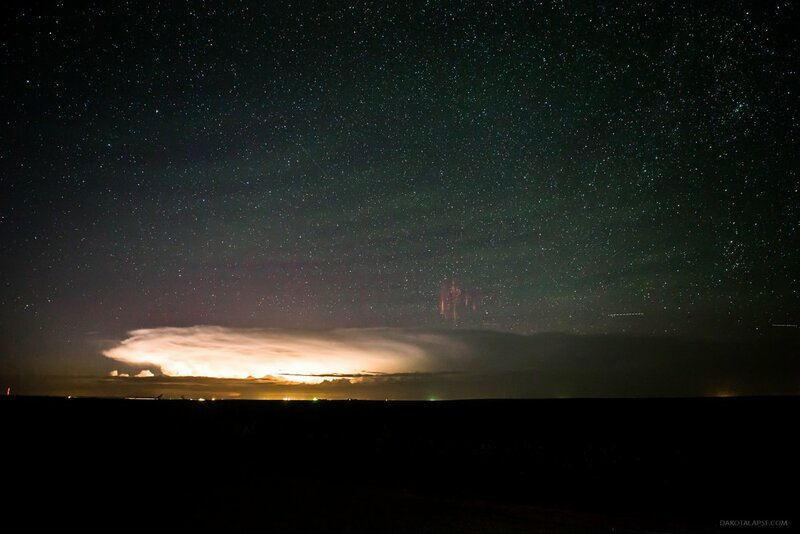 The “glow” seen here is not the aurora borealis, but instead it is airglow (atmospheric chemiluminescence), which is a photochemical reaction that occurs high in the atmosphere when various atoms get excited from the ultraviolet radiation from the Sun. Miguel explained via email that the yellow light is from emissions from sodium atoms in a layer at 92 km, and above it, is green light from oxygen atoms in a layer 90-100 km high. This emission layer is clearly visible from earth orbit, which we’ve seen in many images and videos taken from the ISS. An annotated version of the Milky Way and airglow seen in the Dark Sky Alqueva Reserve in Portugal. Credit and copyright: Miguel Claro. Miguel used a Canon 60Da – ISO 1600; 35mm lens at f/2; Exp. 15 secs. Mosaic of 23 images, taken on June 15, at 02:35 AM. You can see another image on Miguel’s website taken on the same night and place, where airglow is visible with the Andromeda Galaxy (M31) and still another with the Big Dipper and gravity waves with the airglow. If you couldn’t tell, we love time-lapse videos… whether they’re made of photos looking up at the sky from Earth or looking down at Earth from the sky! This latest assembly by photographer Bruce W. Berry takes us on a tour around the planet from orbit, created from images taken by astronauts aboard the International Space Station and expertly de-noised, stabilized and smoothed to 24 frames per second. The result is — like several others before — simply stunning, a wonderful reminder of our place in space and the beauty of our living world. See more of Bruce’s time-lapse projects here. Music: “Manhatta” composed & performed by The Cinematic Orchestra. Original images courtesy of the Image Science & Analysis Laboratory, NASA Johnson Space Center, The Gateway to Astronaut Photography of Earth. A pair of images from NASA’s Cassini spacecraft show Titan glowing in the dark. Titan never ceases to amaze. Saturn’s largest moon, it’s wrapped in a complex, multi-layered nitrogen-and-methane atmosphere ten times thicker than Earth’s. It has seasons and weather, as evidenced by the occasional formation of large bright clouds and, more recently, an area of open-cell convection forming over its south pole. Titan even boasts the distinction of being the only other world in the Solar System besides Earth with large amounts of liquid existing on its surface, although there in the form of exotic methane lakes and streams. We have NASA’s Cassini spacecraft to thank for these discoveries, and now there’s one more for the ceaseless explorer to add to its list: Titan glows in the dark. Seen above in two versions of the same calibrated raw image, acquired by Cassini on May 7, 2009, Titan hovers in front of a background field of stars which appear as blurred streaks due to the 560 seconds (about 9 1/2 minutes) exposure time and the relative motion of the spacecraft. The hazy moon’s dim glow — measuring only around a millionth of a watt — comes from not only the top of its atmosphere (which was expected) but also from much deeper within, at altitudes of 300 km (190 miles). The glow is created by chemical reactions within Titan’s atmosphere, sparked by interactions with charged particles from the Sun and Saturn’s magnetic field. The light is analogous to the airglow seen in Earth’s atmosphere, often photographed by astronauts aboard the ISS. Still, even taking known sources of external radiation into account, Titan is glowing from within with an as-yet-unexplained light. More energetic cosmic rays may be to blame, penetrating deeper into the moon’s atmosphere, or there could be unexpected chemical reactions or phenomena at work — a little Titanic lightning, perhaps? Read more on the Cassini mission page here, and see more images from Cassini on the CICLOPS imaging center site. Images: NASA/JPL-Caltech/Space Science Institute. 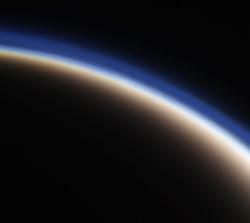 Inset image: Titan’s atmosphere and upper-level hydrocarbon haze, seen in June 2012. Color composite by J. Major. Tracing a bright star upon the Earth, the lights of Russia’s capital city blaze beyond the solar panels of the International Space Station in this photo, captured by the Expedition 30 crew on the night of March 28, 2012. As an electric-blue dawn flares around Earth’s northeastern limb, the green and purple fire of the Aurora Borealis shimmers and stretches away to the northwest above a pale yellow line of airglow. Traveling at 17,500 miles an hour (28,163 km/hr), the ISS was approximately 240 miles (386 km) above the Russian city of Volgograd (formerly Stalingrad) when this photo was taken.